We all know the world is going to hell in a handbasket, but I didn't expect Nintendo - lovely, cheery Nintendo - to be the ones to deliver the final sign of the end times. That's right, the home of Mario and Pikmin has just put a cardboard box on sale for $7. A cardboard box to keep your Nintendo Labo cardboard in. The audacity. Put off by the fact that you might not be able to figure out how to use a box - a simple container that humankind has managed to conquer since the first cavemen want to stop their pet beetles escaping? There's a video. The cheek. The box has a cute name, Okatazuke, which means tidying up, and it's described - shoutout to Google Translate - as "a convenient box made of cardboard that can be stored" which isn't a lie but also applies to literally any other cardboard box that has ever held toilet roll, tampons, or cheese slices. This box costs 800 yen ($7.25), has dimensions of 485mm x 360 mm x 355mm, and will start shipping in Japan this month. Oh, and each box only has enough space for the gubbins from one Labo kit, so cardboard superfans will need to buy a bunch. Honestly, Marie Kondo has a lot to answer for. 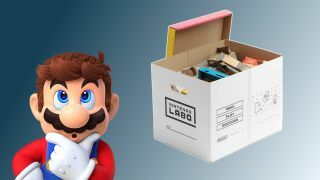 While you wait for your cardboard boxes to be delivered in - let's face it - some other cardboard boxes, check out our hands on with Nintendo Labo VR or build up your collection with our best Nintendo Labo deals.